Each person has a story to tell, and their side. Our memories prove unreliable alone. We need to talk to people, to gather facts and sources. Ultimately, we grasp parts of the truth when discussing the past. We need this perspective to approach Nadja Spiegelman’s memoirs, I’m Supposed to Protect You from All This. 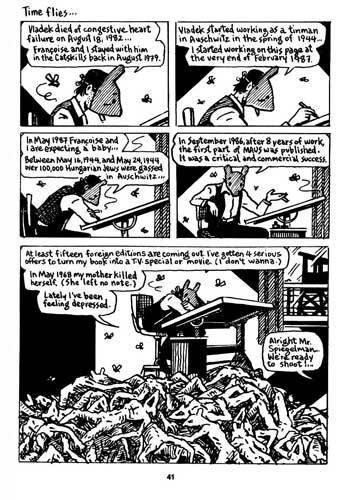 Nadja is Art Spiegelman’s daughter, and Art wrote Maus: A Survivor’s Tale, a comic memoir of his parents surviving the Holocaust. Maus tells Vladek’s story of surviving the Holocaust, and Art’s attempts to survive his father, whose miserly ways appear more irritating than whimsical. Francoise in the story appears as one of the sane people because she and her parents exist peripherally to Art’s stress. She discusses the flaws in Art’s portrayal of animals as allegories for different nationalities, due to her being French and Jewish. Art also uses Francoise to embody the hope that their generation can make happiness out of the ashes of their past. Nadja’s memoirs tell a different story. She adds depths to her mother, showing Francoise’s flaws, virtues, and a cycle that Francoise inadvertently passed on to her daughter. Nadja’s words hope to break that cycle by chronicling it. She verifies the truth in what she and her family remembers. Telling stories seems important for the Spiegelman family. They want to capture people on the page as they are, not as flat cardboard cutouts. Nadja, for example, discusses how her great-grandmother Mina was jailed for collaboration with the Nazis but always protected her child. Her grandmother Josee was nasty to Francoise, but also rescued her daughter from a suicide attempt. Josee also protests when Nadja describes Mina as a collaborator. The women flit through different worlds, contained within Paris and New York. Nadja’s story also concerns itself with truth. She acknowledges that memory is unreliable, and that it’s possible to make mistakes about what happened and who was at a certain place. Using oral history of her mother’s side of the family proves interesting, for example. Francoise tends to contradict what she sees as wrong. Nadja has to fight against this unintentional gaslighting. Arguments with her mother didn’t help. It’s almost like reading a prose version of Alison Bechdel’s graphic memoirs, where she discusses how her narrative appears unreliable, and that she uses photographs and diary entries to confirm what was real or not real. Nadja speaks for ours, for the children born into the 1980s-90s without major stresses, only to encounter 9/11. She recounts being at a school near Ground Zero, and her parents frantically searching for her. They biked her as close to the tower as possible, so that she could see them before they fell. The moment falls into the grey area: you don’t want to be at the center of a tragedy, but you need to bear witness. You need to realize how life can be happenstance, that one random event can cut it short at any age. She also describes the act of living. Everyone has problems and suffering, regardless of their status in life. We have to decide how we treat others, and how we want to survive; Nadja even tells her mother this at one point. Survival can become the greatest defiance of suffering, to pursue our goals despite our loved ones saying “no.” We have to keep living, especially in times of crisis. Nadja pushes past the cycle of emotional abuse, to defend her existence and identity. She has written a phenomenal book, and has cemented herself in our public sphere. I wonder what other stories will emerge from her pen.